We have a number of free downloads, all relating to African wildlife, that you're welcome to download and use. Our colorful and eye-catching wildlife screensavers showcase images of African animals taken in the wild in a variety of locations, including some of the great game reserves and national parks of the Southern Africa region. Our original WildpicsSaver, featuring 25 top-quality images, comes in two sizes for download, optimised to fill your screen. The one (2.8MB size) is designed for larger (17") monitors and the smaller one (1.78MB) will work better on smaller monitors. 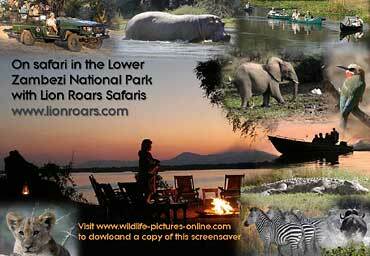 There is also a free screensaver available featuring safari pictures specifically from the Lower Zambezi National Park. UPDATE: Our premier screensaver, African Elephants - Giants of the Wild, that previously sold for $14.95 is now free to download and install with no restrictions. Please visit our Wildlife Screensavers page to find out more and download the screensaver(s) of your choice. There are two Wildlife Brochures for downloading. They're like printed brochures, with turning pages, so no scrolling is necessary. Once downloaded to your PC (won't work on Macs unfortunately), you don't have to be connected to the Internet to open the brochures. They're fun to flip through and also a good learning resource for kids who're interested in animals. Both can be downloaded from the Wildife Brochures page. There are more than a hundred photos that can be downloaded and used for personal or commercial purposes. Go to Free Wildlife Pictures, to see what's available and how they can be used.